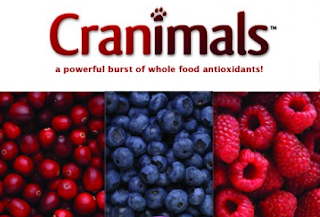 Cranimals™ whole food supplements and award-winning functional biscuits offer proprietary ingredients that you won’t find in any other pet product. These cat and dog supplements deliver a powerful blend of cranberry, red raspberry and blueberry extracts which contain thousands of potent antioxidants - nature’s best defense against disease and aging. They never use any fillers, artificial colors, flavours or artificial preservatives in any of their products –that’s a guarantee. Cranimals™ will make tails wag!